Well, its been a few days since I posted about my experiences with the Canon EF 300mm f/2.8 L II IS lens. The last time I wrote was last Saturday, which turned out to be an excellent day. It wasn’t particularly great on bird variety, but for the birds available, I feel I managed to create my best bird photographs ever. Chickadees are such energetic, photogenic, and fearless birds…you can almost get right on top of them before they fly away. Anyway. One of my favorite bird subjects are Herons. Three heron species are fairly common in the areas around where I live: Great Blue Heron, Night Heron, and Snowy Egret. I’ve been photographing these birds for a number of months now, particularly the Snowy Egrets as they are just a tad more comfortable with human presence than Great Blues or Night Heron’s. I’ve managed to get some pretty good shots of Night Herons in the past, including the one below. That particular bird must not have seen me, as it landed on a tree maybe 20 feet away, giving me a rather rare opportunity to photograph it in extreme detail. I was a little worried at first that I would be unable to photograph any of these beautiful birds while I had this wonderful 300mm lens. On Sunday the 26th, in the afternoon, I found a couple Snowy Egrets fishing in the Cottonwood Creek wetland area at Cherry Creek State Park. I’ve photographed Snowy Egrets here before on many occasions. I’ve enjoyed my time out here in the past…it tends to be fairly quiet (relative to the louder din you usually hear in a city). 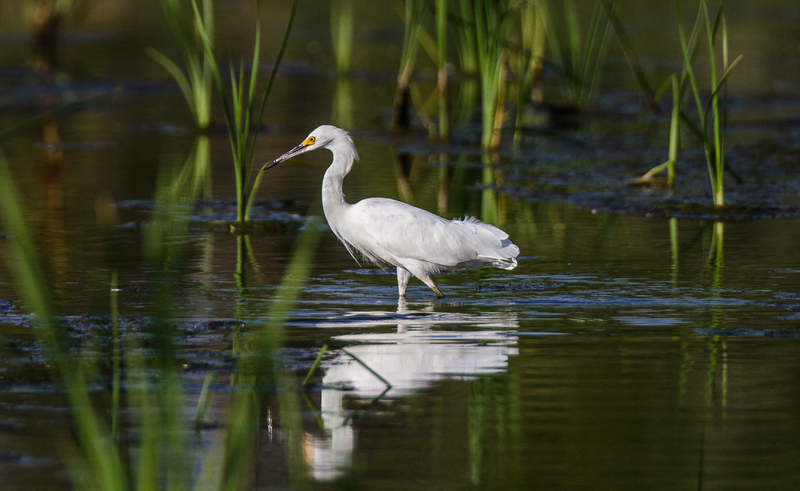 I’ve never been entirely satisfied with my previous egret photography, though. Over the past couple months, I’ve begun to wonder if my skill had hit a wall, as I’ve been unable to keep pushing the quality of my photographs like I had been throughout the earlier part of the year. Through the May, my work went from soft and noisy to less soft and much less noisy, with more fine feather detail and improved color quality. However it lacked the kind of stunning clarity and detail that I’ve seen from the bird photographers who inspire me. I’m certain I can do better, although for a while I wasn’t sure how. While I am sure I have a very long way to go before I reach the pinnacle of my skill in bird photography, I believe my current equipment is part of the problem. While my previous photos of egrets are acceptable, with the 300mm f/2.8 lens and the 2x teleconverter, the results are truly amazing (well, amazing compared to what I was doing before)! The deep, rich color, the sharpness of the birds, even the reflection of ripples in the water on the birds…I feel as though I’ve finally been able to capture a Snowy Egret properly. The lighting was actually better than I’m normally used to, so that certainly had an impact on my ability to expose properly. The 50% greater reach of a 600mm lens, however, definitely did its job. I was able to sit just outside their comfort bubble, leaving them entirely unstressed, yet still able to nearly fill the frame with each bird. Absolutely terrific photos of both the snowys and the night heron! The snowys particularly are in a beautiful setting! Looks like that lens is working great for you. BTW, I like your blog. You have some FANTASTIC shots birds in flight!